Just in time for Valentine’s Day, Disney and Marvel have released an early gift for al their fans. We know that filming on the massive Avengers: Infinity War has been underway for a few weeks now, because well, day one was celebrated like a global holiday. But what was that day like? Who was on set? What was it like watching all those characters come together? Well thanks to the fantastic ladies and gents over at Disney and Marvel, we too now know what day one was like. 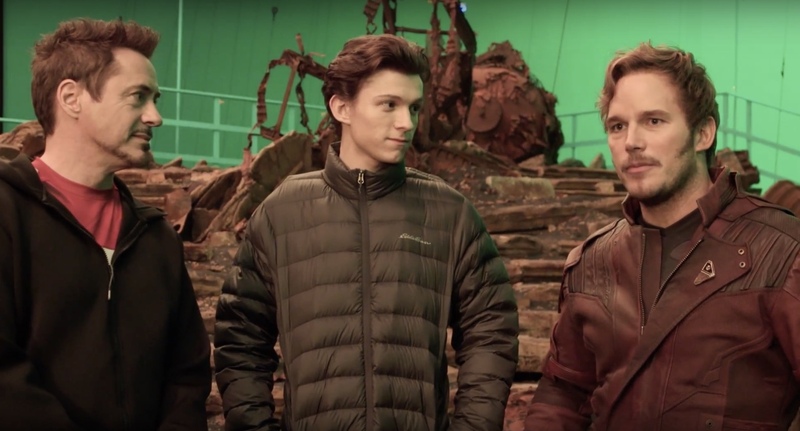 The first official day of production was on January 23rd, and thanks to the video, we see that at least, at least Robert Downey Jr., Chris Pratt, and Tom Holland were together shooting a scene that looks like it takes place in some kind of space setting (possibly meeting up with the Guardians?). While the actors don’t reveal much, their remarks are some of the most exciting from the video as they know, just as we fans do, that this film is massive in more than one way. And the coming together of not just these actors and actresses, but these characters, will be on an epic scale. Following comments from Iron Man, Star-Lord, and Spider-Man, what follows is where the real geekdom begins. As we hear words from Kevin Feige, the Russo Brothers, and others involved in the film, and their words are very encouraging and insanely exciting, the video cuts to brief moments of concept art for Infinity War (which you can see below). We see an image of Thanos bring together the infinity stones, a look at Tony Stark once again building an arsenal of Iron Man suits, and what’s the best image from the video by far, a team-up of Rocket Raccoon and Thor. But it isn’t just a team-up. While that kind of pairing is one we’re all waiting to see, if you look close enough, Thor is no longer holding Mjolir, rather a staff/spear type weapon that features a sharp/sword like object on its tip. What does this mean? Has Thor lost hold of his powerful hammer? Does it get destroyed in the destruction of Thor: Ragnarok? Only time will tell, but questions like that is what makes Avengers: Infinity War so damn exciting. Check out the nerdgasmic featurette below and after doing so, let us know your thoughts in the comments. How pumped are you after watching this video? What’s the most exciting aspect to you? Which team-up are you looking forward to the most? Joe and Anthony Russo’s Avengers: Infinity War hits theaters on May 4th, 2017 and stars a long-list of names that’s too damn long to name off.